This entry was posted on July 28, 2015 by trutta. It was filed under Photography & Imagery and was tagged with Naude's Neck Pass, Nommer Asseblief, Phone booth, Rhodes. Ha Ha! That is my buddy “PD” in there. As far as I can remember he emerged from there WITHOUT a red cape and his underpants worn on the outside! That phone (an old fashioned one with a crank riunger, that dialled through to the manual exchange, was operational until less than 20 yrs ago! It was near the top of one of our highest mountain passes, and was there in case you got stranded in the snow up there. Can’t remember seeing that Publieke Telefoon anywhere. Did it serve as a loo? and where? 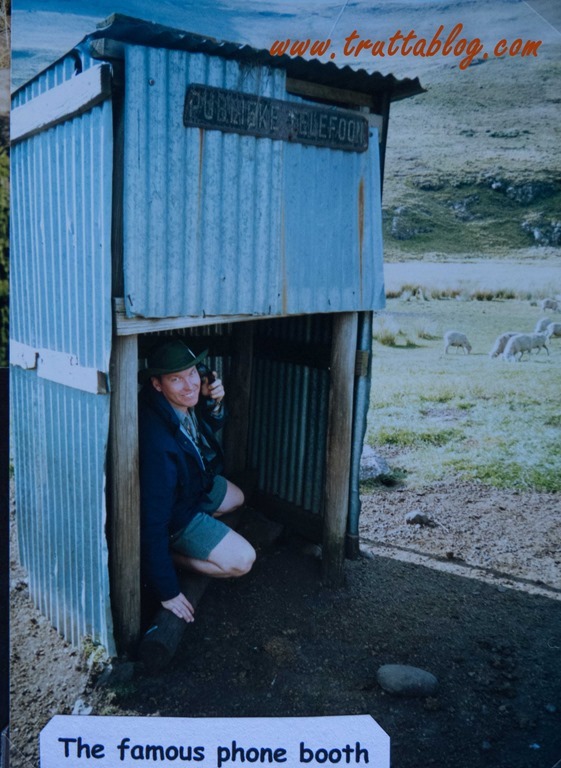 For the sheep it was a loo! It was at the top of Naude’s Neck Pass, and with a wind of the handle, you could pick up and speak to the “tannie” in Barkly East, who would ask you about the weather up there. Some of those special things will just never be the same!